Three separate overnight camping trips even in the middle of summer is a bit much. It's a lot easier to go out on a tour of even short length and "get into the swing of it", rather than string together separate overnights. The getting ready, getting out, coming back, and unpacking for only one night away? It gets exhausting. Coming into all this nice weather in October, I knew I wanted to get in as many bike overnights as possible. But I knew that two would be pushing it. I didn't have any grand plan of doing three in a month, each a week apart, it just happened that way. Bob of Bantam Bicycle Works, the man who fixed my Raleigh Wayfarer, proposed a bike camping trip to Stub Stewart State Park on Tuesday October 29th. I've been to Stub Stewart for the past few New Years, but that was in the cabins. It had been a long time since I had been actually camping in its nice hike-in campsite, so this would be a good excuse to check it out. And this time it would be a social camp out with people I knew rather than the (mostly) solitary affairs of the last two trips, which was really good. I don't think I could bear another lonely camping trip right now, especially since I've been feeling pretty lonely as it is. This also meant that I would be able to ride many of the roads I would ride on the Verboort Sausage Populaire on Sunday November 2nd, that is, if I could ride the Verboort Sausage Populaire, as work conflict swith this randonneuring event this year. * Three birds, one stone, eh? Unfortunately plans unraveled shortly before the trip. On Monday Bob let us know that he messed up his hand in a bike accident the night before and was unable to ride out. Still, there was supposed to be a few people meeting at his shop in the morn to ride the 40 miles out to Stub. I opted to ride out on my own later on in the day mostly because I'd rather ride out at my own pace. And I cut the distance short by taking the MAX light rail from downtown Portland to Hillsboro in the westside suburbs. The ride out from the MAX station was pretty uneventful and done many a time before. Still, it was nice to get away from the metro area for a bit. And the "metro area" drops off dramatically just a mile or so outside of Hillsboro. Suburbia traded in for bucolic farmland roads with hills in the distance. Thanks, urban growth boundary! 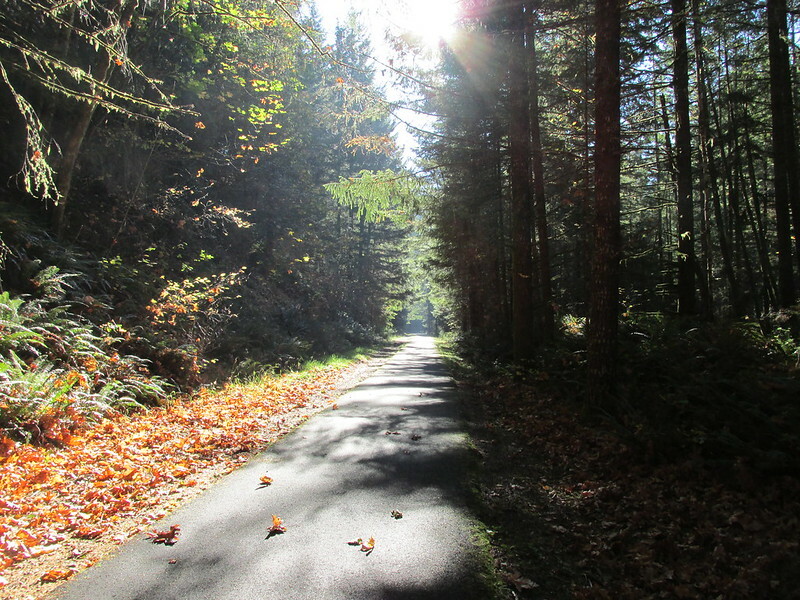 The highlight of the whole "riding to Stub Stewart" experience is the Banks-Vernonia State Trail. 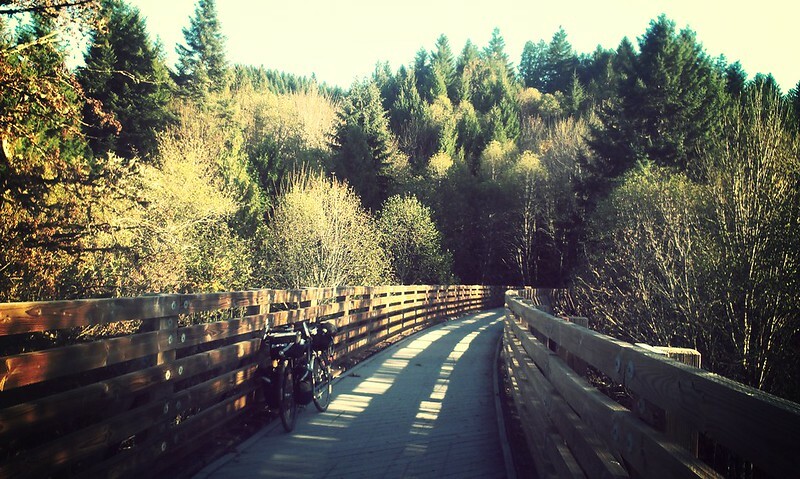 A former logging railroad converted to bike path, the 22 miles between Banks and Vernonia are true cycling bliss. Of course I paused at the Buxton Trestle for a photo-op. 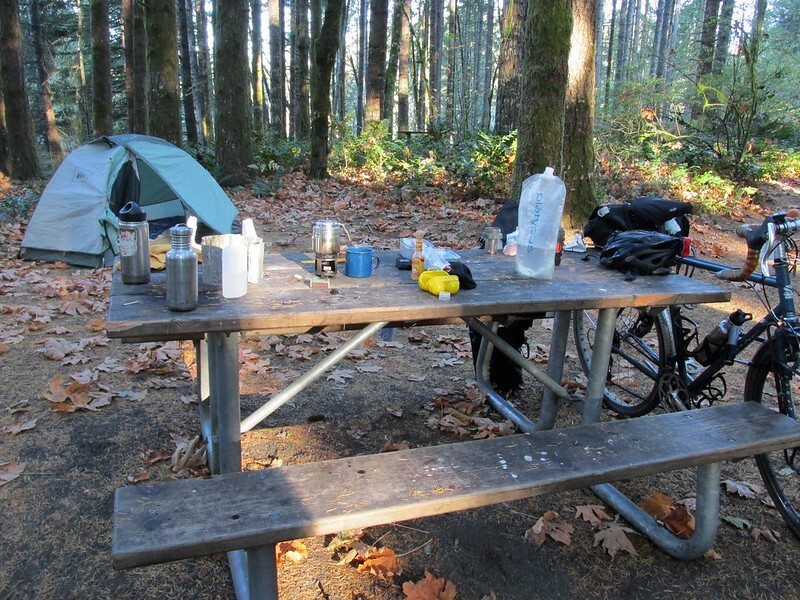 I rolled into the Brooke Creek Hike-In campground at 5:30, just a half-hour before dark. And...no one? I thought there would be a few bike campers here, as Bob said there would be, but nothing, nada. Actually that's not entirely true: at one of the 2 dozen campsites in the Brooke Creek loop I saw a Coleman tent covered by a big blue tarp. Probably not cyclotourists. And the creepiest part is I never saw anyone over there, neither evening or morning. What's going on? Thankfully Chris showed up around 7:30 pm. He promised he was coming, and was good on his word. We ended up hanging out for a few hours in the dark, drinking wine and talking. We retired around 10 pm, and man the night was cold. Thankfully my sleeping bag kept me appropriately warm, and it was pretty hard getting out of bed (or bag) in the am, as the outside ambient temp was just around freezing. (And Chris took off very early as he had to be to work by 10 am!) But get up I did, and I made breakfast and packed up. Leaving camp it was just around 11 am. 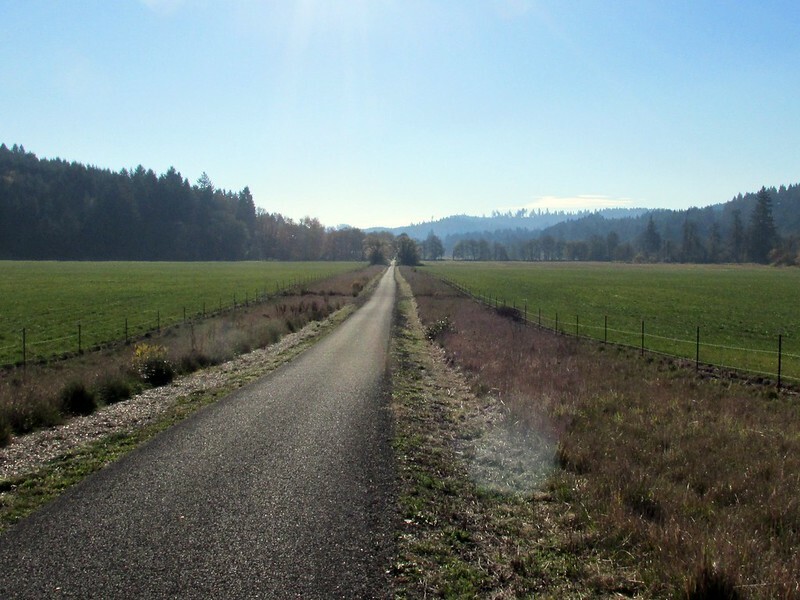 I had originally planned on riding back to Hillsboro "the long way" via Vernonia, Timber Road, and Forest Grove (or maybe just an out and back along the Banks-Vernonia) but practicality trumped ambition, and besides, I had to meet someone in Hillsboro in the afternoon. 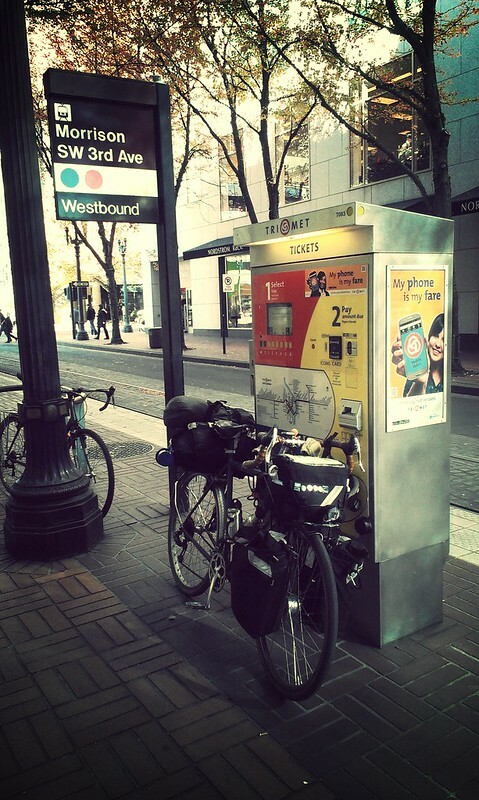 So I rode back mostly the way I had came, but then decided to ride all the way home instead of hopping on the MAX. After navigating through suburbia I crossed over the West Hills via NW Thompson Road and dropped down into the Northwest neighborhood and then made my way home. Overall, this trip was decent, though I wish it was the more social affair that was initially promised. Still, I bike camped for three weeks in a row, which ain't too shabby. And this is the latest in the season I've ever bike camped! Now I really have no desire to ride somewhere and set up a tent until longer days and warmer weather return in spring. I know that I could camp in the winter, but I'd rather ride somewhere and stay in a dry and lit cabin or yurt. And i know that will happen soon enough. *And since I'm a vegetarian, a ride to go eat sausage doesn't hold a heck of a lot of appeal for me. Excellent Shawn, glad to read you were able to get out so much this month! Great ride report, three in a month you are my hero Shawn.